Unfortunately there is no information about Leithaberg DAC available. One of the five specific wine regions in the Austrian state or generic wine-growing region Burgenland, In 2016, a restructuring was carried out with changes in names and territorial boundaries. Leithaberg includes parts of the vineyards Neusiedlersee Hill Country (the name does not exist anymore) and Lake Neusiedl, These are the free city Eisenstadt, the political district Eisenstadt-Umgebung with the municipalities Breitenbrunn, Donnerskirchen, Großhöflein, Hornstein, Loretto, Mörbisch, Oggau, Oslip, Purbach, St. Margarethen, Schützen am Gebirge, Siegendorf, St. Georgen, St. Margarethen, Wulkaprodersdorf and Zagersdorf, as well as the communities Jois and winds (both before Neusiedlersee). At own desire the municipality belongs Rust not in addition (no longer counts to any area). In addition, Leithaberg also became some vineyards of the parish Neusiedl on the lake The rest of the Neusiedler Rieden is part of the Neusiedlersee wine-growing region. At Zagersdorf they discovered Celtic Barrows from the 7th century BC with grape-seed remains. That's why the place counts next Stillfried in the Weinviertel as the oldest Austrian wine-growing community. Several centuries later, Roman settlers planted vines and initiated viticulture. Burgenland was heavily affected by Turkish invasions in the 16th and 17th centuries. From the time of the first Turkish siege of Vienna in 1529 comes the well-known legend of the "Purbacher Turks", who overslept his troops due to excessive wine consumption. When he awoke, he climbed up a chimney and got stuck in the end. He was let live, he later married a Purbacher woman and even became a winegrower. From the community Donnerskirchen dates from 1526 one of the oldest documentary mentions of a Trockenbeerenauslese, the so-called Lutherwein, And in Mörbisch the "opera ball wine" was created for the famous ball in the Vienna State Opera. 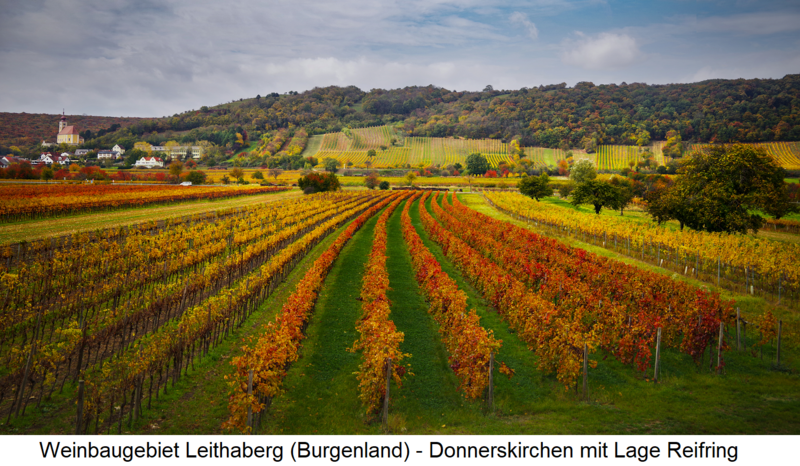 Well-known vineyards are Altenberg. Bandkräftn. Gmärk. Goldberg. Greiner. Mariental. stone mill and Tatschler, The Pannonian climate is characterized by mild spring, dry summer and mostly beautiful autumn. The area extends to the border with Hungary along Lake Neusiedl, which regulates the climate and acts as a heat store. The landscape is therefore also characterized by reeds and water. The Leitha Mountains, the last spur of the Alps in the north, form a protective barrier against cold winds. The soils at about 400 meters above sea level consist of shell limestone and shale with higher clay content at the foot of the slopes. In 2017, the vineyards covered a total of 3,097 hectares of vineyards. 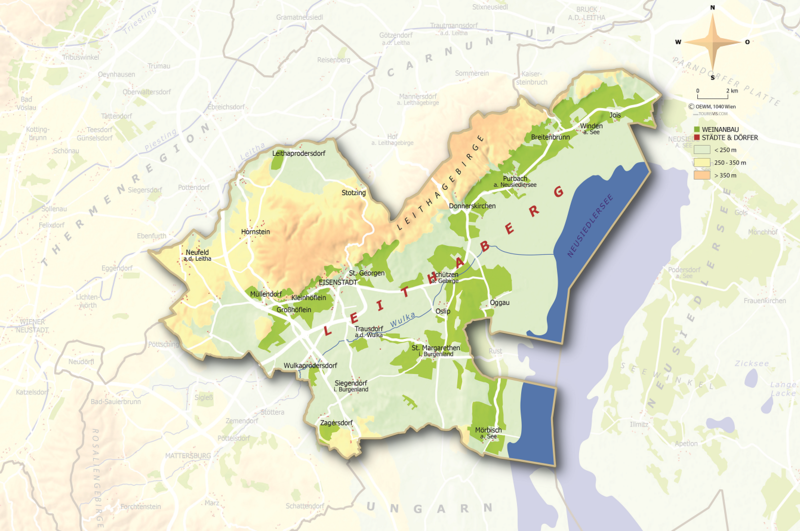 The former wine-growing region Neusiedlersee Hügelland was significantly larger in 2009 with 3,576 hectares, which is not comparable due to changed borders. The proportion of white wines is 54.7%, the proportion of red wines 55.3%. From the year 2008 (red wines) and 2009 (white wines), the quality- controlled Leithaberg DAC was introduced. All other quality wines have to with the ancestry Burgenland, the Vins under the wine-growing region name wine country be marketed. The administration, as well as the production of level wines for the quality assurance takes place by the association Leithaberg. There are red and white wines. The red wine has to go out be pressed, with a blend up to a maximum of 15% with the varieties Pinot Noir. St. Laurent and Zweigelt is permissible. He is in a wooden barrel with a subtle wood note ( toast flavor ) expanded. They may not be marketed until 1 September of the year following the harvest, at the earliest. For the white wines, the varieties Chardonnay. Green Valtellina. Neuburger and Pinot Blanc sorted or in any Cuvée be used. They are mainly dry-built in oak barrels (of whatever size) and have longevity and development potential. The alcohol content must be at least 12.5 to a maximum of 13.5% vol. The taste should be local typicality with the attributes spicy. elegant and mineral respectively. A superficial primary fruit and a noticeable wood tone ( toast flavor ) are not welcome. The wines may be marketed at the earliest on 1 September of the year following the harvest.